AVIT systems can reduce test times from 12-24 hours to UNDER AN HOUR. FiberQA is proud to announce the launch of both our AVIT-BP (for backplane, below) and AVIT-RH (for remote head, right) automated probe-style fiberscopes. The newest models to come out of the AVIT product line are about to change the fiber optic connector inspection game. Like the other AVIT product family members, these new fiberscope probes don’t just boast lightning fast inspection speeds, but automated end-face cleaning as well. You read that correctly…automated cleaning integrated into a probe thta is designed to handle multi-ferrule connectors such as VITA 66 and MIL-38999! People said it couldn’t be done, but we aren’t those people. 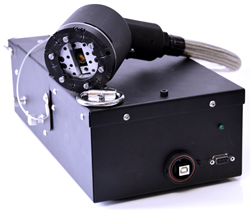 The decision to start developing a probe-style fiberscope was borne out of a request from a customer. The request was to miniaturize our system so that our revolutionary AVIT software could be brought directly to their installed connectors instead of uninstalling and bringing the connectors to an AVIT. The confined spaces posed a lot of very difficult logistical issues, but we were determined to provide the same level of reliable fiber optic end-face inspection that our customers have come to know and trust for over a decade…no concessions, no corners cut. We were determined to design a robust, automated, and above all else, reliable probe. Up until now, it had not been done. As we began developing the RH, BP, and CH (the sister model to the RH and BP) it became clear just how important these systems would be, not just to the military and their contractors, but to the commercial airline industry as well. Being able to inspect and clean ferrules and connectors (such as MIL circular, EPX, and VITA 66.1) without removing them from planes and ships provides a great deal of labor savings, but it also provides mission-critical quality control they can trust. All of our AVIT models require very little active operation, allowing technicians the freedom to complete other tasks while monitoring the inspection progress with a quick glance. There is no longer any need to have highly trained optical inspection experts, only system operators, which is one factor in lowering the cost of labor. Having an automated system produces far more reliable results, and unlike manual fiberscopes, FiberQA’s systems archive evidence to support test results auditing and provide easy to read reports. Using password-protected access, tech engineers can customize or select pre-loaded test specs to ensure consistent testing across all systems and throughout the supply chain without accidental tampering by unauthorized operators. By integrating cleaning into our AVIT models , there is no need to remove and re-insert each ferrule for cleaning, minimizing labor and potential part handling damage. Operators can set the maximum number of inspect/clean cycles before the part is ultimately failed, making FiberQA’s range of test equipment the most efficient and customizable on the market. To learn more about FiberQA’s line of automated fiber optic inspection and cleaning systems, visit us online at http://www.fiberqa.com or email us at sales@fiberqa.com. Our sales team would be happy to answer any questions you may have about our products or our worldwide sales partners and representatives.